Economics is the constant interaction of millions of units, which makes the actions difficult to describe and even harder to predict. A man going to a bakery and buying bread, that's an economic interaction, a man withdrawing cash at the ATM, that's an economic interaction, and a man gambling that his favorite soccer team will win, that's yet another economic interaction. And there are billions of economic interactions of the sort every second, which makes it difficult to put economics into perspective. 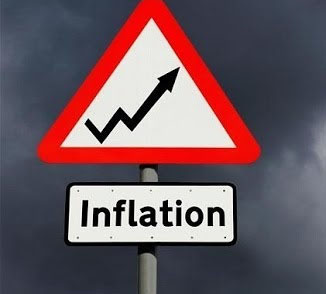 But to define inflation, deflation and stagflation we can look at four areas that can lead to prices going up, going down, or to prices going up and wages stagnating. The four factors are consumption, production, investment and debt. Let's look at consumption first. As I said before there can be consumption for survival needs, for solidarity needs, for altruistic needs, for narcissistic needs, for emotional needs, for factual needs or for narrative needs. Consumption can decrease because of new technologies, because of wars and conflicts, because some transportation passages are blocked, because of hikes on raw materials, because of unfair competition from products made abroad and so on. In case of new technologies, old technologies are discarded, people in the old industries lose their jobs, consumption goes down. In case of wars, conflicts or if transportation passages are blocked, production comes to a halt, transporters have to find other routes, consumer products go up. Raw materials can experience hikes due to monopolies, or wars, political unrest among many reasons. If countries sign free trade agreements with other countries, consumer products from different countries invade the country, people lose their jobs, consumer rates go down. Among many other reasons consumer rates can go up or down. What does this have to do with inflation, stagflation or deflation? If the debt levels are good, people have disposable cash, but that consumer rates are sluggish, say because of political unrest, organized crime, or any other unstable situation that sees consumers contemplating moving to another area and starting their lives over, you have deflation, that is companies trying to attract consumers by offering lower prices. People want to sell their homes, no one is really interested in buying them, so they offer low prices. People want to sell furniture, no one really wants to furnish their homes, so ridiculously low prices are offered. If the debt levels are bad, people have too much debt or borrow too much money, that means they dispose of a lot of cash. Now people want their cash, but in some cases have debt themselves and want to break even. So they inflate prices. When most companies have debt and that operational costs are too high mainly because debt has to be repaid, but also because of inflation, wages stagnate, because higher wages would mean no profit margins or businesses actually losing money. When labor laws stipulate that layoffs have to be met with compensation packages and that businesses are losing money despite having to pay wages, and firing employees is met with compensation packages, you get toxic atmospheres that includes threats, violence and hazing at the workplace and union busting is common. That is because employers have the lose-lose option of either firing workers or keeping them and paying their wages, and lose money either way. Now the crisis can also be a production crisis. A production crisis can take place because of many factors, mainly including crime or unrest in the area, a problem with the production ecosystem (for example electricity or water shortages) or a debt crisis as in inability to repay the debts. When a production crisis occurs, again if crime and instability is the cause, war or threat of war, then you have people in production giving away their goods at symbolic prices. If the cause has to do with production ecosystems, as in electricity, oil or water shortages, prices tend to go up and you get inflation. If the problem is debt, prices go up and wages stagnate, because companies are having trouble breaking even. The same could be said about an investment crisis or a debt crisis. An investment crisis can be due to lack of funds, war, crime or instability in the region or a problem with the production ecosystem including land of raw material prices that are too high, or chronic electricity, gas, water or oil problems. Low investment means lower competition for those who are already in production. War, crime, instability, prices go down. Lack of funds, prices go up and wages stagnate. Chronic shortages, prices go up. Regarding debt there could be low debt, high debt, or chaotic debt. Low debt is when banks have trouble breaking even because they are not making money from interest. Prices tend to go down. High debt, prices tend to go up and wages stagnate. What I call chaotic debt is high debt plus high crime rates, instability and threats of war. Prices can actually go down, because people want to sell and leave.